This in-between-time is a time for a “significant pause” – a pause that refreshes! Jesus was “taken up to heaven”. . . What is ‘heaven’ to you? The eleven, so important to Luke’s gospel, are named, as is Mary the mother of Jesus. This is an indication of the parallel between the Spirit’s overshadowing of Mary at the conception of Jesus, and the Spirit’s overshadowing her and the other disciples at the birth of the Church. There is great significance in the coming together of Jesus’ followers, not only as individuals but also as one body. (Foundations in Faith, p. 101) What experiences of gathering together with family and friends during times of confusion or anticipation have you had? Why was it important to be together…what was the result of your coming together? Prayer is a part of all of our readings today. Since the twelve play such a key role as witnesses to Jesus’ ministry and the subsequent gospel proclamation, Luke sees it as essential that they be at full complement before the coming of the Spirit. Mary, Jesus’ mother is the living personification of faith, the “brothers” of Jesus and the women (who were probably at the crucifixion) are all gathered together to pray (R. Faley, Footprints on the Mountain, p. 357). Margaret Guenther says, “…there is no such thing as a private Christian spirituality. Christian spirituality is a family affair: it is lived in the midst of relationships with God and those around us,” (The Practice of Prayer, p. 10). What does prayer do for you? You have to learn conventional wisdom before you can get to post-conventional. It’s the wisdom after wisdom. This is what Peter is talking about. Jesus showed us that he suffered because of evil in the world. If we want to be like Jesus, then we might have to as well. But it is all for good. Knowing that can bring us peace and glorifies God. It is a deep knowing that abides with us now. It is the other side of knowing…does that make sense? How can you incorporate that in your life? The Paschal Mystery is a cycle for rebirth; this is what Jesus taught and lived. Terminal death — a death that ends life and ends possibilities. Paschal death – a death that while ending one kind of life, opens the person undergoing it to receive a deeper and richer form of life. Resuscitated life – when one is restored to a former life and health. Resurrected life – this is an entirely new way of life. Jesus did not get his old life back. He received a new life – a richer life and one within which he would not have to die again. Jesus gives us a pattern in which with his help we, too, can experience this Paschal Mystery – throughout our lives – in many little deaths and risings – until someday we enter into the ultimate experience of this mystery – which is really God’s love for us – calling us always to fully experience his eternal love and life. This quote by Hans Kung points to the “of one accord” from our 1st reading and nods in this 2nd reading (“sanctify” from Latin, to make holy and “conscience clear”). These words illustrate a point that being closer to God and inviting Spirit to work in our lives involves intention and openness. Richard Rohr in The Naked Now says, “The mind wants a job and loves to process things. The key to stopping this game is, quite simply, peace, silence, or stillness…stop labeling, ranking, and categorizing people and things and just see them…when this happens to you, you are now a living paradox: at one and the same time utterly connected to everybody else in a compassionate and caring way, and absolutely free to be your own self.” Do you hear it? Remember the word flesh, “sarx”, is the whole person as s/he lives wounded, broken and attention-seeking (little self that is insecure and trapped). Spirit, “Pneuma”, is the whole person when knowing and trusting God (the true, big self that responds to God’s love). We are living into our baptism as we live more in Spirit! Recall Deacon Ron’s homily on Spirit as our spiritual GPS. We must only believe and trust in Spirit to show us the way, or re-calculate when we stray! When does God dwell among us? The gospel says it is when we love, keep Jesus’ word, and believe. Rather than three different tasks, these are really three descriptions of the same action – giving of one’s self – a self-sacrifice that leads to life. And, what does God bring when God dwells among us? God brings us Holy Spirit, the Advocate, to enlighten us, to empower us, to put our troubled, fearful hearts at work and at peace. What does this mean to you? “chosen race” – “royal priesthood” – “holy (consecrated) nation” What does each mean for you? How does each move us from darkness into God’s light? 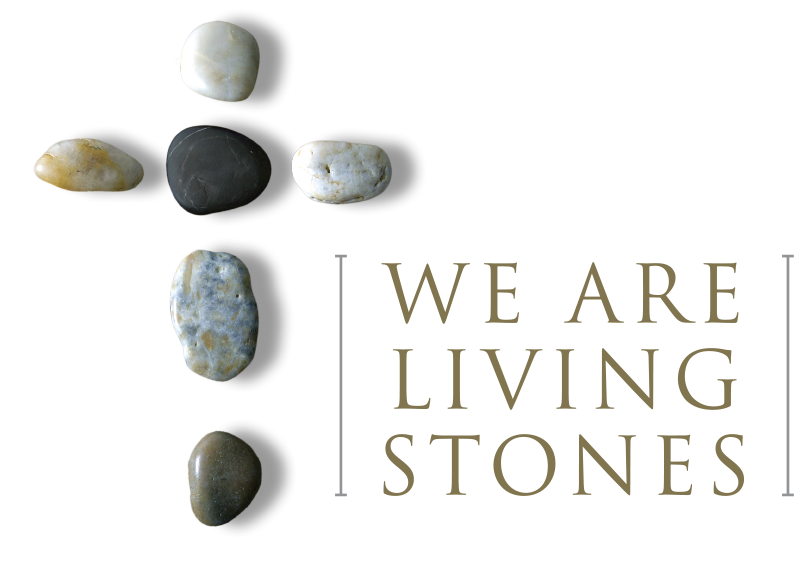 Christians, the living stones, are joined by Christ himself who is the cornerstone – the foundation that supports the living stones. In the Old Testament no one was to approach the rock of Sinai, under penalty of death. Contrast that with Jesus, the cornerstone, who invites his people to come close to him. He has created something new and wonderful. He has gathered his living stones and formed them into a new people, a new religion (W&W, Birminham, p. 308). There is no secret word, no magic potion, no hidden wisdom. If there were, Jesus would surely have found it. We must learn to read the truth between the lies. Jesus is not the Solution; He is the Way. And the best he can give us is some direction along the way. Peter’s listeners were “cut to the heart”. This is what repentance or conversion is all about. Peter’s message was urgent. Repentance was not understood just as the turning away from a laundry list of sins. For Peter’s crowd it meant a radical reassessment of who Jesus really was-what his significance was (W&W, Birmingham, p. 300). Who is Jesus to you? Right now? In one of his quests Percival enters the castle of the Fisher King who has been wounded in the groin in a hunting accident, representing a loss of his generative powers. His wound will not heal and as a result, his kingdom becomes a wasteland. There is drought, crops will not grow, pestilence and disease are everywhere, all of which is symbolic of a disease of the soul. The wasteland comes about when one acts not out of authenticity, but out of the power of one’s position. Joseph Campbell calls this wasteland the inauthentic life, a state of being which is barren of the truth of who you are. In ancient cultures, the vitality of the kingdom was dependant on the vitality of the king. Percival, who had always acted spontaneously out of his own nature, for the first time remembers that a knight is not supposed to speak to a king until spoken to first, and even though he is moved to do so, does not ask, “What ails you?” the words that would have healed the king. He is escorted from the castle and when he turns to look back, it is gone. He says, “Alas, what is God? Were He great, He would not have heaped undeserved disgrace on us both. I was in his service, expecting His grace. But I now renounce Him and His service. If He hates me, I shall bear that. Good friend, when your own time comes for battle, let a woman be your shield, (CM, 452). You are not supposed to get a second chance. Percival realizes his mistake and spends many years searching for the castle, during which time he falls in love. Now in this new kind of relationship to a woman, Percival again finds the castle, asks of the Fisher King, “What ails you?” and thus heals the king and restores the land. When Parzival asks ‘what ails you?’ he has experienced the other in himself. The reality is that compassion is in humanity, and is our prime expression. What cuts to Percival’s heart? What results from his conversion? His own change of heart affects the whole kingdom. Note the parallels in this story to the scripture passage. Jesus is our heart of compassion within us. Remember that Jesus’ wounds became his identification marks after resurrection. As ‘wounded healers’, we can let the Spirit of Jesus help us to bring life out of the good and the bad times of our lives. This letter is written to a people –many of whom were slaves — who were being persecuted for their faith under the Roman Emperor Domitian at the end of the first century. Their endurance in the face of suffering helped the church to survive even to this day. May we trust in this same Spirit when we face difficulties. (Celebration, April 2005). How do you think we are ‘healed’ by the wounds of Christ? In today’s world we encounter many gates. There are gated communities, gates of entry into theaters and sporting events, toll gates. Each gate represents both a dividing line and a means of entry. How does this speak to your spirituality?